At A.T.E. Solutions, we offer a fast and reliable device programming service. With support for a vast number of devices from different suppliers, whatever your device programming needs, we will provide a speedy and cost-effective service. 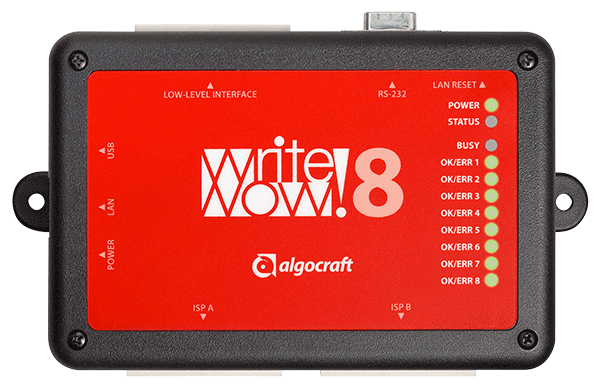 Our engineers write test programs using the Algocraft series WriteNow! In-System Programmers, which are a breakthrough in the device programming industry. Easy to install and use, they enable high speed, parallel programming, with the ability to program up to 8 devices at once – saving time and costs. The WriteNow! programmers support a large number of devices (microcontrollers, memories and other programmable devices) from various manufacturers and have a compact size for easy ATE / fixture integration. They work in standalone or connected to a host PC (RS-232, LAN and USB connections are built in), and are provided with easy-to-use software utilities. It goes without saying that these outstanding technical features are matched by an experienced and professional approach. At A.T.E Solutions we have over 30 years’ industry experience and our knowledgeable engineers have worked with a huge array of different devices. Together with our excellent customer service, our years in the business guarantee you an unrivalled device programming service. If you are looking for a device programming service to assist with your testing process, you have come to the right place. Contact us on 01604 859185 or email sales@atesolutions.co.uk to discuss your needs.